The Northwest’s snowpack isn’t as robust as water managers would like. At high-elevation near Mt. Adams, creases in the snowpack reveal where rain has run downhill. In Washington, snowpack is around 79 percent of normal -- which could be bad news for spring crops. He says that when the snow level goes up into the higher elevations 1,000 feet day after day, it’s sort of like a pyramid -- less surface area to collect more snow. When there isn’t enough water in a drought, junior water right holders -- like the Roza Irrigation District in the Yakima Valley -- get rationed water. 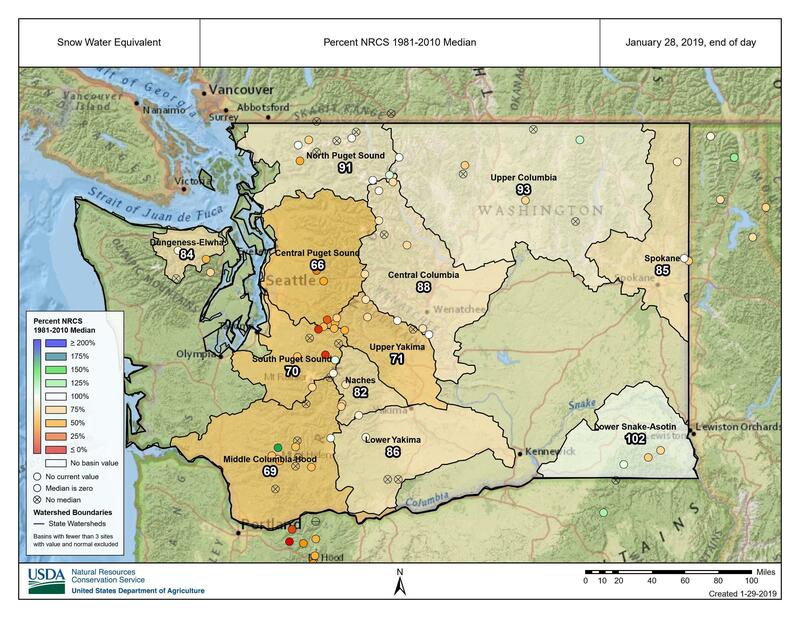 As of late January 2019, much of the Washington snowpack was under historical averages. Every five years, a team convenes to evaluate long-term water supply and demand for the Columbia River Basin. For eastern Washington, the water supply will increase, but not when demand is highest. April is the traditional start of the whitewater rafting season. The hefty snowpack in the mountains this year is good news for commercial rafting companies and recreational enthusiasts across the West. The early heat wave across most of the Northwest is forecast to start winding down Wednesday. It might have felt nice while it lasted, but the unusual warmth --record-setting, in some cases-- compounded the rapid melting of the Northwest's precious mountain snowpack. When winter officially ended last month, snow measurements showed near normal to above normal snowpack across the Northwest. In four short weeks though, the snowpack in Oregon, Washington and Idaho has significantly eroded.